On tour with the correct ice axe! Glaciers, sun and a breathtaking mountain panorama - what more could a mountaineer want? In order for your alpine tour to be a success you need to select the right equipment. A good ice axe with appropriate length, functional clothing, appropriate footwear, a comfortable backpack and crampons should be included in every mountaineer's basic gear. But how do you choose the right ice axe for your tour? Until the 1970s simple ice axes were used for all alpine adventures in the snow and ice - from mountaineering to ice climbing. Nowadays climbers have a large number of ice axes to choose from, specifically designed for everything from simple glacier trips to challenging adventures in steep terrain. 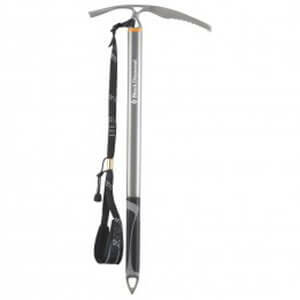 As a rule of thumb, an ice axe with a straight shaft is sufficient for flatter glacier passages as it is used primarily as a walking stick in these conditions. Ice axes with a curved shaft are used for steep terrain as they are better suited to climbing. A rubber-coated handle improves grip, allowing you to pull yourself up the ice. Remember that the use of two ice tools is recommended for ice climbing! The rule of thumb when buying an ice axe, as determined by experts, is that the axe should not touch the floor when your arms are by your sides. In recent years many climbers have been leaning towards shorter axes, which certainly has its benefits on steep terrain. Ultra-light ice axes are often carried by ski tourers in case of emergency and these too are very short. The same applies to the curvature of the shaft as does to the length, plan in advance what sort of a tour you will be going on.